The Timeguard PDSM1500 Enhanced PIR Occupancy Sensor takes PIR Presence Detection to the next level. This unit provides optimum coverage and with up to 1500W loading and 10m detection range it is the ideal choice for all energy saving installations. Switches lights ON when presence is detected and to light level (LUX) settings. 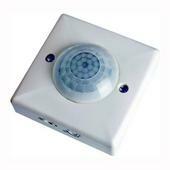 Ideal for energy saving installations in the workplace, corridors, offices, toilets etc. Up to 1500W loading (6A) for incandescent, halogen, fluorescent and inductive lighting or 250W (1A) fan. Enhanced 360° detection zone for optimum coverage. Time ON – 1 to 30 minutes. IP55 environmental rating(internal use only). Can also be mounted on a standard BS surface mount or flush mount box.